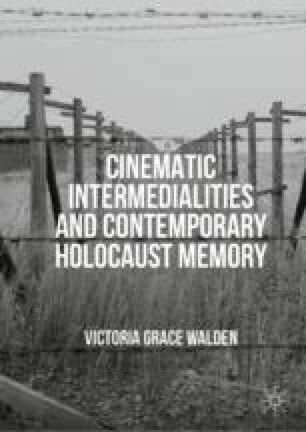 In this final analytical chapter, I leave the familiarity of more traditional forms of ‘cinema’ to interrogate the increasingly popular notion of ‘virtual Holocaust memory’ through a Deleuzian lens. I explore the use of digital screens in, or as extensions of, heritage spaces through an analysis of The Room of Names (Raum der Namen) installation (2005), part of the information centre (Ort der Information) below the Memorial to the Murdered Jews of Europe (Denkmal für die ermordeten Juden Europa) in Berlin and the mobile app Oshpitzin (2014), which offers augmented reality tours of the Polish town of Oświęcim. Although, I contest the common use of ‘virtual’ as a synonym for the ‘digital’, I argue in this chapter that these particular digital examples explicate the existence of a virtuality and original actuality that remain only in the past sheets of time as they draw attention to their inability to make the events of the Holocaust fully accessible to visitors and users. I am interested in the ways material presence highlights absence and virtuality through the use of the digital. In relation to Oshpitzin, I also challenge the assumption that repetition prevents memory (as many trauma theorists, Holocaust historians and Deleuze, have claimed). I explore the ways in which repetition articulated alongside accentuated difference can enable productive Holocaust memory. I also return in the closing pages of this chapter to the way archaeology helps an assemblage to disrupt traditional, stratified organisations so as to allow new connections to be made, which enable fresh ways of thinking and feeling about the past. Sontag, S. (1996, February 25). The Decay of Cinema. New York Times. https://www.nytimes.com/books/00/03/12/specials/sontag-cinema.html. Accessed on 25 August 2016.